Julie's immobility in no way impeded her activities. In spite of her suffering, she managed to co-found a teaching order that tended to the needs of both the poor and the well-to-do. Each of us has limitations, but the worst malady any of us can suffer is the spiritual paralysis that keeps us from doing God’s work on earth. Born in Cuvilly, France, into a family of well-to-do farmers, young Marie Rose Julie Billiart showed an early interest in religion and in helping the sick and poor. Though the first years of her life were relatively peaceful and uncomplicated, Julie had to take up manual work as a young teen when her family lost its money. However, she spent her spare time teaching catechism to young people and to the farm laborers. A mysterious illness overtook her when she was about 30. Witnessing an attempt to wound or even kill her father, Julie was paralyzed and became a complete invalid. For the next two decades she continued to teach catechism lessons from her bed, offered spiritual advice and attracted visitors who had heard of her holiness. When the French Revolution broke out in 1789, revolutionary forces became aware of her allegiance to fugitive priests. With the help of friends she was smuggled out of Cuvilly in a haycart; she spent several years hiding in Compiegne, being moved from house to house despite her growing physical pain. She even lost the power of speech for a time. But this period also proved to be a fruitful spiritual time for Julie. It was at this time she had a vision in which she saw Calvary surrounded by women in religious habits and heard a voice saying, "Behold these spiritual daughters whom I give you in an Institute marked by the cross." As time passed and Julie continued her mobile life, she made the acquaintance of an aristocratic woman, Françoise Blin de Bourdon, who shared Julie's interest in teaching the faith. In 1803 the two women began the Institute of Notre Dame, which was dedicated to the education of the poor as well as young Christian girls and the training of catechists. The following year the first Sisters of Notre Dame made their vows. That was the same year that Julie recovered from the illness: She was able to walk for the first time in 22 years. Though Julie had always been attentive to the special needs of the poor and that always remained her priority, she also became aware that other classes in society needed Christian instruction. 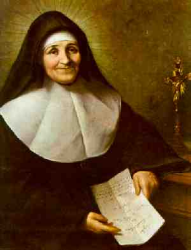 From the founding of the Sisters of Notre Dame until her death, Julie was on the road, opening a variety of schools in France and Belgium that served the poor and the wealthy, vocational groups, teachers. Ultimately, Julie and Françoise moved the motherhouse to Namur, Belgium. Julie died there in 1816. She was canonized in 1969.